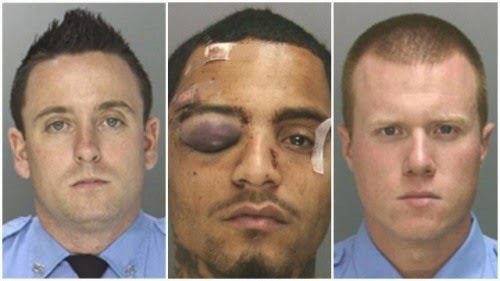 Officers Sean McKnight and Kevin Robinson turned themselves in Thursday and, according to Philadelphia Police Commissioner Charles Ramsey, will be fired once their 30-day suspension is up, The Philadelphia Inquirer reports. The two have been charged with aggravated assault, simple assault, and conspiracy, among other offenses. The May 29, 2013 incident was investigated when the victim’s girlfriend uncovered video surveillance that showed the officers beating 23-year-old Najee Rivera. The officers pulled over Rivera after he allegedly ran a stop sign, but Rivera fled when he became frightened by the sight of both officers walking toward him with their batons in hand. The initial report stated that the officers caught up with Rivera when he fell off his scooter a few blocks away. The report also claimed that Rivera threw one officer against the wall and tried to wrestle the baton away from another.